Infusion therapy involves the administration of medication through a needle or catheter, typically when patients are not able to take medications orally. Education and fostering independence are two of Advanced Home Care’s core values. That’s why patients who receive intravenous (IV) antibiotics at home are taught to be active participants rather than merely recipients of treatment. Although the first antibiotic treatment is administered by a member of our nursing staff, patients are taught how to start an IV line, flush the line and clean the needle site so that they can continue treatment on their own. A pharmacist contacts patients each week to check on their progress and make sure there are no issues with the medication or supplies before sending out another week’s dose. This process continues for as long as the patient is on antibiotic therapy. Patients receiving anticoagulation therapy, such as coumadin, require close monitoring. At Advanced Home Care, one of our pharmacists works solely with coumadin patients and is available 24 hours a day, seven days a week, to adjust coumadin dosages as needed. This dedication to coumadin monitoring decreases the amount of time it takes to make potentially life-saving adjustments to a patient’s coumadin dosage. Once available only in the controlled environment of a hospital or clinic, intravenous chemotherapeutic agents can now be administered in a patient’s home thanks to advancements in infusion pump technology. Nurses at Advanced Home Care are available to administer single or multiple doses over a specified period of time as needed. In addition, some patients can be taught how to manage the infusion pump system and administer their chemotherapy treatments themselves. Used as an immunizing agent to treat or prevent illness in patients whose own immune systems are weakened by a chronic disease, intravenous immunoglobulin therapy, also known as IVIG therapy, is given on an intermittent basis. Advanced Home Care nurses administer the therapy and monitor the patient during the initial stages to ensure there are no adverse reactions. However, because the therapy takes several hours to complete, patients are taught how to remove the needle and bandage the site themselves once the process is completed. This cardiac therapy is used most often to alleviate symptoms associated with Congestive Heart Failure (CHF) and Chronic Obstructive Pulmonary Disease (COPD). With Congestive Heart Failure, patients’ hearts do not pump effectively, causing them to wear out. With inotropic therapy, administered through an infusion pump, the nurses at Advanced Home Care are able to increase the heart’s ability to contract, thus increasing cardiac output. Similarly, Chronic Obstructive Pulmonary Disease patients benefit from a continuous infusion of inotropics to help improve blood flow and oxygen delivery through the body. Patients who experience pain as a result of surgery or chronic disease can receive pain management assistance at home through Advanced Home Care. Our infusion pumps allow patients to continually receive a measured amount of pain medication intravenously. In addition, the pumps can be programmed to deliver additional doses of pain medication, known as bolus doses, as prescribed by the patient’s physician. Patients are monitored regularly by our in-home nurses to ensure they are receiving the correct amount of medication to control their pain, and adjustments are made in consultation with the patient’s physician. At Advanced Home Care, our nurses are trained to assess pediatric patients as needed for infusion therapy. We take into account a child’s size, age and activity level to help determine which infusion method will work best and always create an individualized plan of care for each patient. As with all of our patients, the goal is to minimize the need for hospitalization whenever possible and maximize independence for both child and parent. For patients who are not able to receive nutrients by mouth or feeding tube, Advanced Home Care offers total parenteral nutrition (TPN). This intravenous nutrition method allows patients to receive a balanced amount of calories, vitamins, minerals, proteins and fats as prescribed by their physician. Most patients receiving TPN are infused on a cyclic schedule, generally over a 12-hour period and most often at night while they sleep. TPN can also be given continuously, based on the patient’s specific needs. However, the pumps are small and portable, so patients can travel away from home and still fulfill their nutritional needs. 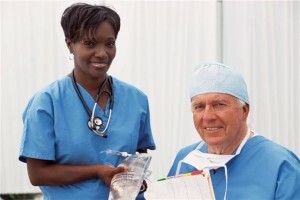 Our skilled nurses work with TPN patients in the initial stages to teach them how to connect their bags to the IV, inject any necessary medications into the nutrients, clean the site and tubing and recognize signs and symptoms of infection. Then, a nurse will visit on a weekly basis to monitor the patient’s weight and draw lab specimens as needed.